Talking to a member of Birdlife Australia at the Taroona Seaside Festival yesterday, I was able to confirm that the bird I saw was a lyrebird and yes, they do nest in trees at night! Birdlife Australia works for bird conservation and also runs a variety of volunteer programs. I'm looking forward to learning more about our feathered friends, maybe even getting some decent pictures, and am really pleased to have found people who are able to answer my many questions and identify some of the plants and animals I have encountered on my travels. Re: The high intertidal range in the North of Tasmania (Baker's Beach) and in the Gulf of Carpentaria. Also at the Seaside Festival in Taroona, I had the opportunity to talk to Geoff, a marine scientist who added that the depth of the water also plays a role, thus here in the south where the ocean is deep, you do not get such a big tidal range. Geoff also showed me the biggest sea urchin - live, that I have ever seen dead or alive. It was almost the size of a basketball if you include its nasty spines and was a deep burgundy colour. Wish I had taken a picture, but was too astounded to think of it. Yes, I know that's rare - a bit like a member of this family being speechless. 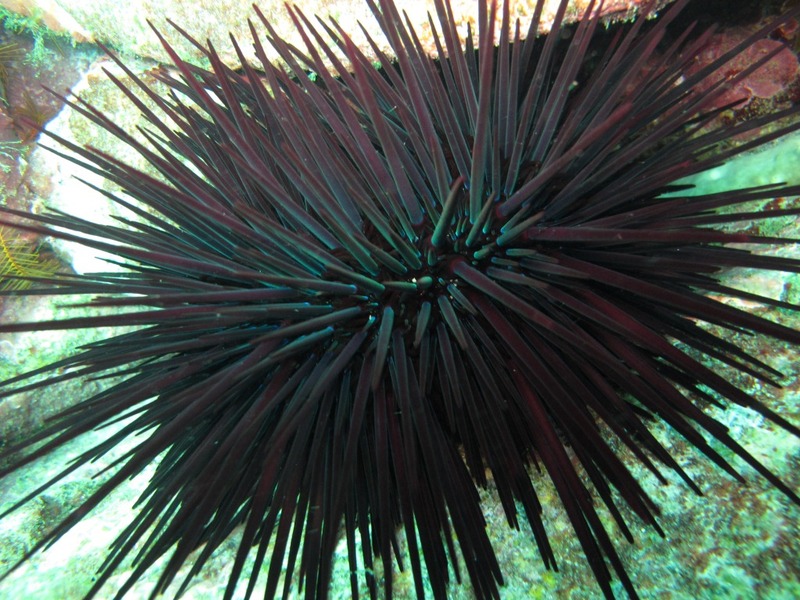 Don't handle them (sea urchins) yourself if you find a live one. The spines are smooth one way and have a serrated edge the other way that prevents them being pulled out. Jemima Stuart -Smith at Redmap * has also identified some of my earlier finds at Roches Beach. If you should find anything unusual at the beach, take a photo and report it to www.redmap.org.au or get the Redmap App. "Redmap stands for Range Extension Database and Mapping project. This project invites Australians to share sightings of marine species that are ‘uncommon’ to their local seas. Over time, Redmap will use this ‘citizen science’ data to map which Australian marine species may be extending their distribution range – a.k.a moving house - in response to changes in the marine environment, such as ocean warming. Redmap members use their knowledge of the seas to help monitor Australia’s vast coastline. The citizen science data also highlights regions and species that may be experiencing more distribution changes, so that research can be focused into these areas." Apparently our waters are warming at twice the global average and this is having a big impact on some marine species. I love how the website says. "A temperature rise of a few degrees doesn't sound like a lot; it actually sounds quite nice, especially if you have ever been swimming down south, " ... but even one degree causes coral bleaching and two degrees permanently kills it. I haven't checked recently but some marine species are now moving further south -also hitherto unknown predators and diseases, and putting Antarctic species at risk. Sad to say the pretty white shrub below which I thought was a cottonwood has the unfortunate name of Stinkwood (Zieria arborescens) according to Bob and Joy Coghlan at the Society for Growing Australian Plants. "A Guide to Flowers and Plants of Tasmania" by the Launceston Field Naturalists Club, available direct from them if you can't find it in a bookstore. There is a comprehensive list of guidebooks at http://www.apstas.org.au/publications.html."